It was our last day in Jodhpur. The fourth day of a nine day trip to Rajasthan. We had covered Mehrangarh Fort, and the old blue city rather well the previous days. Jaswant Thada too was on our list, though I was not too hopeful. What is so great about cenotaphs, I said out loud. Yet, come morning we decided let’s just check it out. It was a short walk from our airbnb homestay and the day was bright and sunny. The cool December breeze made sure I put on a jacket even though it was close to noon then. I put on my newest fashion obsession – a ruffles maxi dress and we were off to our destination. Beautiful windows are always a pleasant sight to see. How cute is this little window for a sneak peek? We were greeted with this enormous entry into the compound. For a state like Rajasthan which is burning hot for most part of the year, the greenary surrounding this compound was spectacular. Tall lush green trees with picture perfect clear blue skies. It was a sight to behold. The property sat right opposite a lake called Devkund which attracted a number of migratory birds from all over all year long. Standing on the edge of the lake, one can see beautiful views of Mehrangarh Fort from Jaswant Thada. Its amazing how one tourist location can be jam packed with crowd whereas another is serene and peaceful. 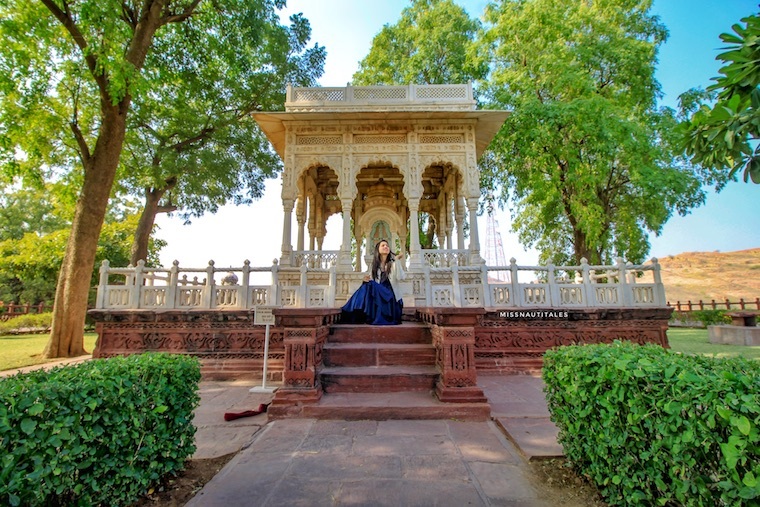 Even though both Mehrangarh and Jaswant Thada are at a walking distance from one another, its a stark difference in how popular each destination is. But, where is the Beautiful Taj Mahal Jodhpur? Well, Jaswant Thada is better known as the Taj Mahal of Marwar. It’s because of his stellar marble structure that shines even from a distance. It’s beautiful. The main building is built like a temple, with several domes and carved architecture. The marble sheets used in making this structure are extremely thin and polished so that they emit a warm glow when illuminated by the sun. The complex also features a memorial of a peacock that flew into a funeral pyre. For a cremation ground, this historical place is just stunning. Built in 1899 by Maharaja Sardar Singh in commemoration of his father Maharaja Jaswant Singh II. It serves as the cremation ground for the royal family of Marwar. There are three other cenotaphs in the grounds. The cenotaph of Maharaja Jaswant Singh displays portraits of the rulers and Maharajas of Jodhpur. For more details about Jaswant Thada, check out the official Rajasthan Tourism page.